Have you ever ridden a horse? Would you like to? The Orange County 4-H Horse Program is hosting a Horse Fun Day! Ride a horse lead-line, groom a horse or pony, learn about horse anatomy, tack, and stamdardbred breed. Bring your camera! Food will be available for purchase. Join the Friends of Forsyth Nature Center, Kingston Parks and Recreation, and the Junior League of Kingston on Friday, October 26th, 2018 from 5:30pm-7:30pm for a fun filled evening at the Forsyth Nature Center. “Boo at the Zoo” is a Halloween treat for children of all ages. Families are encouraged to come in costume to this free event and enjoy s’mores over a campfire, snacks, live entertainment and a costume parade. Revel in the spectacular Fall foliage of the Hudson Valley at the 3rd annual Gobble & Groove! 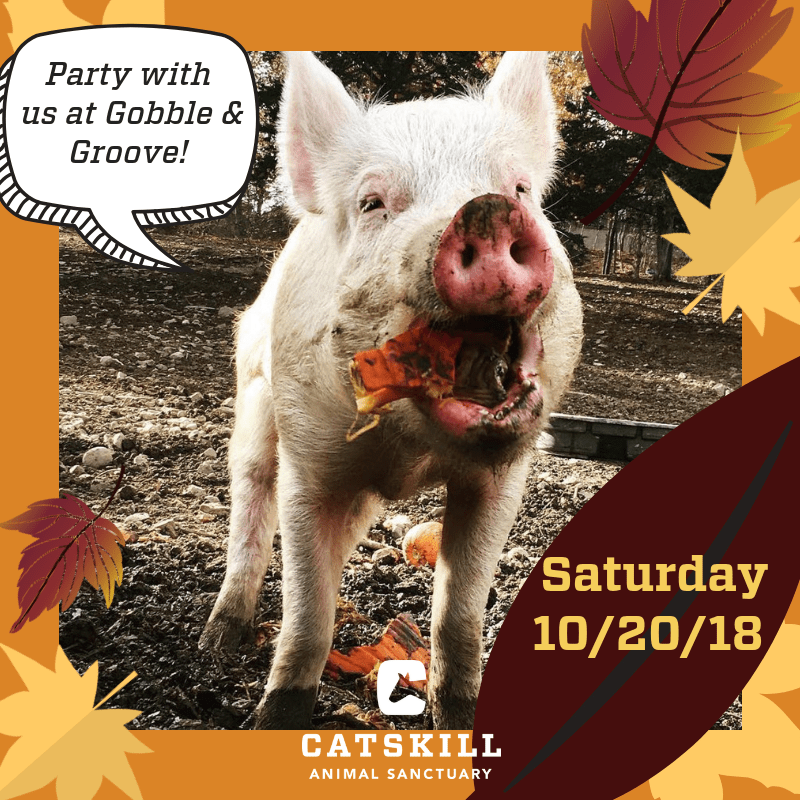 Celebrate the beautiful turkeys who call Catskill home as we honor them with a special feeding of their favorite treats (the pigs get some too!). Enjoy an autumn feast with sweet and savory treats by The Cinnamon Snail, Yeah Dawg, Rockin’ Raw, and Healthy Gourmet To-Go, as you jam to live fiddle music from The Bad Cats and newgrass from Stranger at Home. Bond with rescued turkeys, pigs, goats, horses, cows, and more! Don’t miss our special guest speaker, best-selling author Gene Stone who has written or co-authored 45 books, including Eat for the Planet, The How Not to Die Cookbook, Mercy for Animals, Living the Farm Sanctuary Life, My Beef with Meat, Forks over Knives: The Plant Based Way to Health, The Secrets of People Who Never Get Sick, and The Engine 2 Diet. The celebration will go on rain or shine! Pumpkin picking, hayrides, hay maze, haunted barn, farm animals, country midway, seasonal treats and refreshments weekends only. Hayrides run continuously on Saturdays, Sundays and Columbus Day from 10:30 am-5 pm and twice on weekdays at 4:30 pm and 5 pm. Immerse yourself into the ancient art of nature, mindfulness, and self-awareness. Join Mohonk’s Naturalist, Michael Ridolfo as he teaches time-tested principles of tracking and nature observation, authentic survival skills, and the spontaneous attention that occurs when we move through the arena of the natural world.